In a workshop taught worldwide, these noted mime artists teach advanced concepts of mime technique developed by Marcel Marceau and Etienne Decroux. This video studies techniques in depth such as hand designs to create the illusion of a hat, jewelry, sewing, painting, typewriting, oration, caressing, a serpent, an angel, and commands; marches such as march on two points, feline march, tiger march; the theory of Axis (Decroux); Projections and Translations; and Pivots. 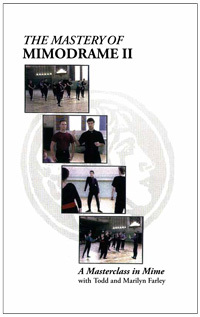 Each technique is introduced and explained step-by-step and is shown clearly and slowly on the DVD. A booklet outlines these concepts and explains their history and theory.